Before we get into today's post, I want to give a hat tip to Megan Fitzpatrick of Hachette Audio, who inspired yesterday's post. I hesitate to name names in a forum like this, but she said she didn't mind, so I'm happy to give her the nod for helping me to come up with a topic. "Are you the actor who did the 1992 narration on The Adventures of Augie March? If so, it was a drop-dead brilliant performance. You're a genius." Why yes, yes I am that guy, thanks! Parker’s reading...is masterful...a model of balance and control; he brings a dimension of performance to the novel you simply cannot get by reading the novel yourself. His clear voice and exact tempo capture the spirit and rhythms of the text. Parker's performance allows you to visualize the images of the novel with amazing vividness. 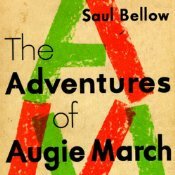 Listening to this superb reading of the novel makes clear that this is one of Bellow’s most entertaining and profound books. Tom Parker creates all of Augie's extraordinary acquaintances while merging, in one compelling voice, Augie's own conflicting traits into a fate that is never final because his "character" is to dream something better. This must-listen should be in most collections. Look, I quote these things as a tribute to Bellow more than myself. The book is amazing and probably his most engaging and accessible work. As for me, I remember thinking it was very difficult, and feeling a little self-conscious because I wasn't really the right voice for it (as a rule, I don't do "Chicago" and I certainly never considered myself an expert on Bellow). And the story itself is hazy in my mind, probably because I was so busy threading through the breathless virtuosity of the writing. It's entirely possible that I read it cold. But something went right because, listening to it today, I'm surprised at the synergy of it. It's not typical of my "style" back then--it's extremely relaxed and fluid, as though I just surrendered myself to the book and never looked back. It reminds me of a story about (I think) Laurence Olivier, who gave an amazing performance one night but, upon being complimented by his fellow actors, remarked that it depressed him because he couldn't remember what he did right. Unfortunately the recording is in bad shape. Blackstone has a new recording of Herzog up on Audible, and we have four more Bellows coming out later in the year: Seize the Day, To Jerusalem and Back, The Dangling Man and The Victim. (I've got my eye on Seize the Day, lest anyone out there get any bright ideas.) Augie is showing his age. I've asked our engineers to look into remastering it with some of their new techniques. I'd like to redo it, but I'm not sure I could do it as well. I'd be thinking about it and would probably ruin it. Then again, I'd love to rediscover what I did right. I might learn something. It's a strange commentary on my career that the books I spend the least amount of time thinking about usually get the most attention. Maybe there's a lesson for others in there--or maybe not.